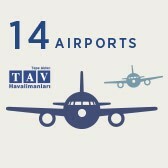 TAV Airports Holding, Turkey's leading airport operating company, was founded in 1997 as a consortium among Tepe, Akfen and SERA Construction following the success in winning the tender for the İstanbul Atatürk Airport International Terminal as one of the first examples of airport operation projects undertaken under the “Build-Operate-Transfer” model. 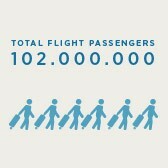 TAV’s main hub, Istanbul Atatürk Airport is one of the world’s largest 20 airports with the passenger traffic grew at 20% in 2012. TAV Airport takes pride in operating for 652.000 flights and providing service to more than 83 million passengers across the globe. In 2013 the organic and inorganic growth resulted in a rise in adjusted revenue of 10% to €1.205 billion, EBITDA rose 17% to € 397 Million, and the reported net profit of €133 Million. In May 2012, 38% of TAV Airport Holding’s shares, which was worth 874 Million USD, has been bought by Aeroport de Paris (ADP) which is one of the largest Airport Enterprises in the world.